AFC Fylde got the better of Ramsbottom United at the second attempt to earn a home quarter-final against National League rivals Barnet in the FA Trophy. The Northern Premier League club again gave Fylde a scare as they scored first at Mill Farm, but the Coasters took control and ensured there was to be no repeat of last week’s extraordinary 5-5 draw as the freescoring Danny Rowe netted twice. 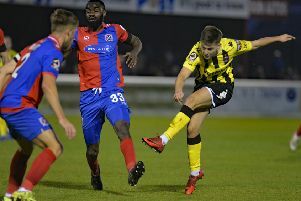 James Hardy started for the Coasters after four months out injured and there was a home debut for midfielder Tom Crawford on loan from Notts County. Fylde started the game brightly, knocking the ball about freely. Ramsbottom were trying to get in behind, winning free-kicks in the final third, but none caused the hosts any problems. The first chance of the game came for the hosts when Serhat Tasdemir won a free-kick on the edge of the area. Danny Rowe took the set-piece but the ball hit the wall and Ramsbottom cleared. The Northern Premier League, who play three levels below Fylde, were having good spells and created their first chance when Iyrwah Gooden got in behind the defence to cut the ball back to Jamie Rother, whose shot was deflected away for a corner. The corner was swung in by the visitors to the near post where Kieran Lugsden was there to head past Jay Lynch and open the scoring on 27 minutes. Fylde were looking for a way back into the game. Rowe fired in another fierce free-kick from 30 yards but keeper Sam Ashton dealt with it well and Ramsbottom cleared. The equaliser arrived on 35 minutes. Tasdemir played a lovely ball through the defence to Rowe, who saw Ashton off his line and chipped the ball over the keeper and into the net. The home side nearly had a second as Ryan Croasdale ran on to a loose ball just outside the area but his first-time shot flashed just wide. Just before the break Fylde had their second as a short corner was taken to Tasdemir, who took a touch and crossed towards the back post, where Jordan Tunnicliffe was waiting to stab the ball home. The second half started with Fylde enjoying most of the possession and they increased their lead just five minutes in. Tasdemir laid the ball back to Arlen Birch. He played a pass in to Hardy, who touched the ball around the corner of the defence to Tasdemir and he slotted the ball first-time into the bottom left corner. Hardy, who was causing the visitors problems, used excellent trickery to get past his man and slip in Tasdemir, who had a sniff of his second but shot just over. Crawford then drove forward from midfield and found the goal-hungry Tasdemir, whose fierce shot was tremendously saved by Ashton. Rowe completed the scoring with his second on 68 minutes. A ball over the top of visitors’ defence was latched on to by Rowe who volleyed superbly past Ashton. The two-goal hero was then replaced and Ramsbottom went close to a second. Lynch punched clear from a corner but only as far as Edward Moran, whose shot fizzed off-target. Thre was not way back for Ramsbottom this time as Rother’s curling effort brushed the roof of the net. Andy Bond went close to a fifth for Fylde, forcing Ashton into one last save after a surging run into the box. Barnet earned their trip to Mill Farm a week on Saturday by winning their replay 2-1 against fellow London club Carshalton. Fylde boss Dave Challinor said of the victory: “We didn’t play well enough first half but had a great reaction following their goal. “They were organised and they were resolute. They didn’t let us have the ball in certain areas. Our movement wasn’t what it should be because they worked their socks off.